A ranch is a business. A ranch is a home. That is why ranchers spend so much time and effort thinking of a name, branding art, and some interesting way to decorate their front gate. 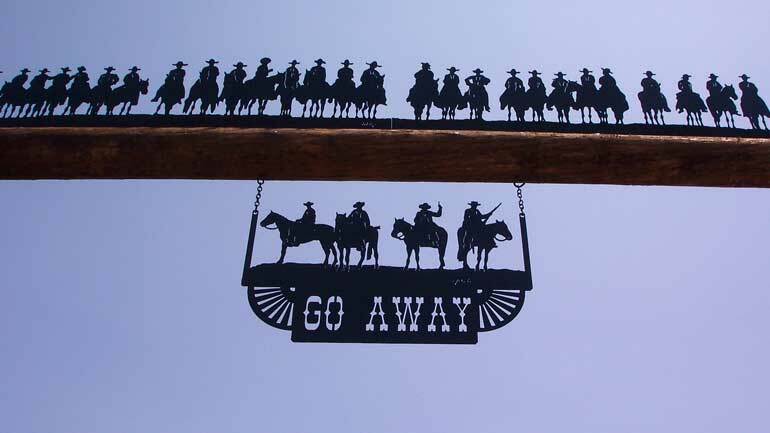 There are many great examples in the state of Wyoming of gate art. Here are, in our humble opinion, 5 of the best. 1). Lickers and Kickers Ranch Jackson Wyoming. It's not just the name, it's the cut ironwork of mountains, man, horses, and wildlife. 2). Go Away. I'm not sure if that is the name of the ranch or just what they want you to do. I'd tell you where they are but the sign gives me the idea they don't want you to know. 3). Eagle Ridge ranch sign was designed and cut in Napa Idaho and shipped to Wyoming. This sign is dart, bold, and pays homage to the mountains of Wyoming. 4). Not all ranch signs are metal the Diamond Ranch of Wyoming has a big beautiful wooden sign and gate Created by Mr. Richard Beal of Wyoming.